The Educational Destination Workshop International (EDWIN) by Global Panorama Showcase (GPS) was launched for the first time in Ladakh on September 25 at Grand Dragon Hotel. The two-day event was organised in association with Overland Escape and Ravine Trek. A total of 100 travel agents and tour operators and 26 exhibitors participated in the event. Both the buyers and the exhibitors build their network, relation and updated for sustainable development. They were also educated and given first-hand experience of the Ladakh region to help them learn more about the destinations, environment, and exposure. 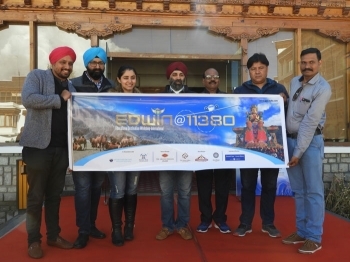 The core focus of EDWIN 11,380 is to promote responsible and sustainable tourism in Ladakh. Tsetan Angchuk, President, All Ladakh Tour Operator Association (ALTOA) and Ghulam Mustafa, Owner Grand Dragon inaugurated the event. He stressed on the need to set strict guidelines by tour operators and agency while arranging tours in the region. Harmandeep Singh Anand, Co-Founder GPS said, “After coming to Ladakh for the first time in the year 2016, I found that this is the place one has to visit in their lifetime. People have to experience the serenity and environment”. “EDWIN -11,380 is organised to benefit the exhibitors as everyone get the opportunity to promote their business and tourism. Agents from 16 different states and 56 different cities of India are present. Otherwise, one has to spend a lot of money to attend such travel fair and couldn’t afford and miss the opportunity. this kind of initiative will help in building their network and promote the destination", he added. He further informed that such programs have been carried out in various other states of India with 600 exhibitors and over 8,000 buyers. Also, more than one lakh meetings across the country were held. Global Panorama Showcase (GPS) is a business meeting point for tourism professionals from the Tier II and Tier III cities of India and the leading Tourism Service providers from India and overseas and is a key forum to shape the future of the industry through networking and education. It is a complete paperless event, the only e-event of its kind in the world right now.